oban tate-e 36.9 by 25.8 cm. This series poses actors in famous roles set against locations of the Tokaido. The views of the stations of the Tokaido are modified versions of those made famous by Hiroshige with his first version of the series published by Hoeido some twenty years earlier. The actors were identified by their roles only due to prohibitions at the time- but the audience would have recognized the actors based on the character titles and their features as portrayed by Kunisada. 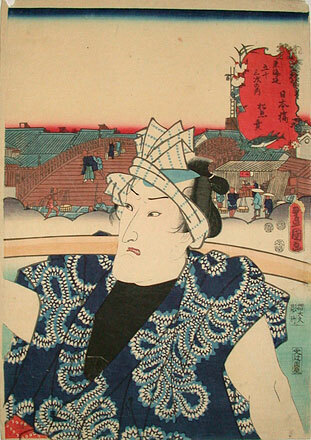 This print depicts the actor Bando Mitsugoro III who first performed the role of the bonito fish peddler in 1813 as part of a 12-role hengemono (multi-role dance perfomed by one actor) titled 'Shiki no Nagame Yosete Mitsudaiji'. The role of the bonito seller became the dance, Katsuo-uri.